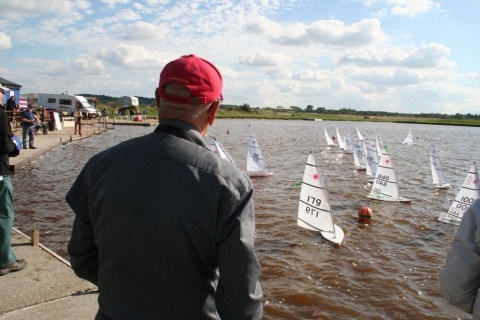 UK Radio Controlled Laser National Championships Report 19th & 20th September. 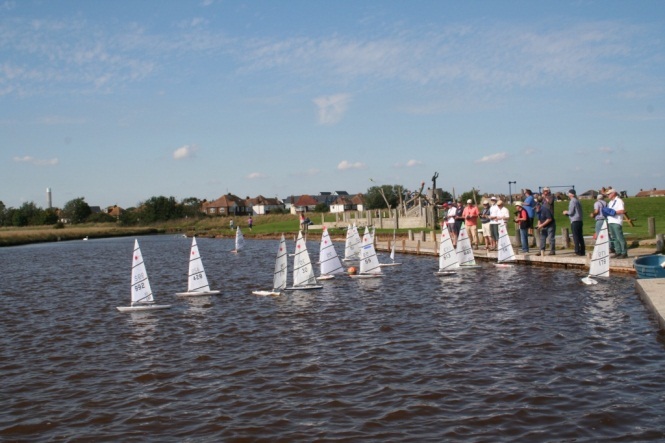 Kent’s Isle of Sheppey Coastal Park Lake was a new venue for the Nationals with all facilities on the spot, including a cafe, and surrounded by flat treeless land on the south side of the Thames Estuary. 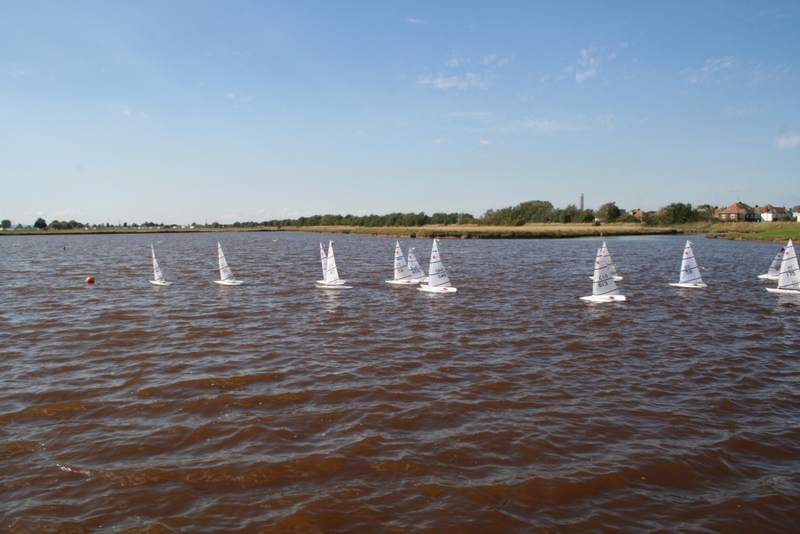 Brilliant sunshine and very light airs gave good racing with few ‘holes’ or big shifts. Day 2 saw 16kt gusts and B rigs. 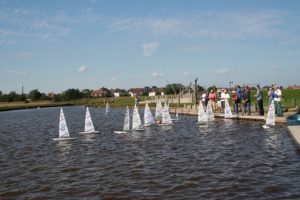 Ten clubs were represented from the UK including nine local boats (Medway and Ramsgate) and from as far away as South Africa. Skill potential was high all round, all entries getting at least one top 10 result. Excellent officiating and buoy adjustments by Robert Owens, Dave Ellis and Doug Spooner gave good courses and even entertainment as the race officer rowed out for one course change while still tied to the dock. Black flag starts were only called three times. Class Racing Secretary Dave Fowler (Kingsmill) made his intent clear from the off with a win from Medway’s Jamie Blair. Adrian Tomlinson (Royal Temple YC Ramsgate/Medway) then showed this was no one horse race posting 1,2,2,1. 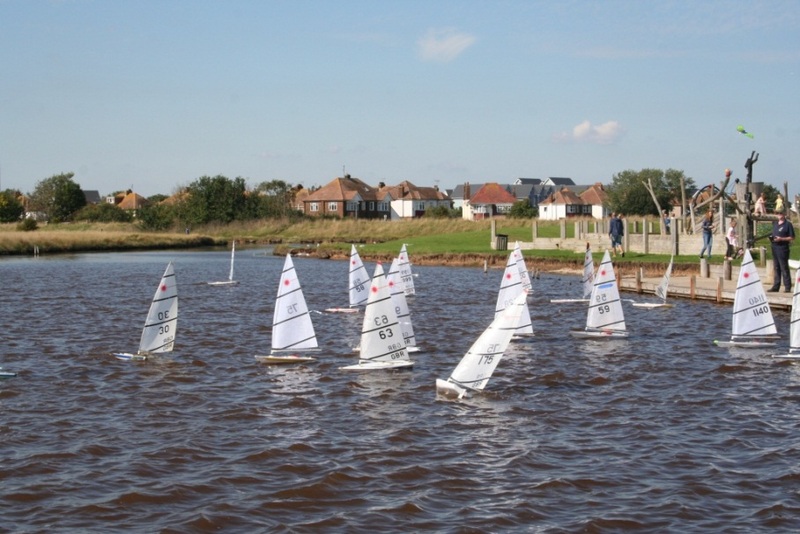 A string of three 3rd places by Tony Owens (Medway) created a gang of 4 at the head of the leader board. Tim Long (Llandudno) found his form by race 7 and posted four 2nd places to get into the mix by the end of day 1. Jamie Blair and Davis Swainson (Gosport) both took wins on day 1 but the rest were shared between leaders Dave Fowler and Adrian Tomlinson (7 and 5 wins respectively). Adrian’s brother David posted consistent 4ths-6th’s but was committed to a J97 on day 2. Ruffled water and dappled sunlight on Sunday made identification at the windward mark and leg 2 tricky from the south facing control area. Brian Holland (SCYC) claimed the first win from Tony Owens but Fowler and Tomlinson were soon again swapping 1st and 2nd places. Exceptions were races 19 & 20 with wins by Owens and Blair from John Sharman (Keighley) and Tim Long. John Park (Gosport) couldn’t repeat his two 2nds on day 1 and slipped out of the top 10 but won the (peer voted) sportsmanship prize. Peter Jackson (RTYC Ramsgate) unpractised in boats under 42ft started plugged in 4th & 5ths, then port tacked the fleet to build a half leg lead in the penultimate race, blowing it avoiding tail enders at the final mark to hand Blair the win. 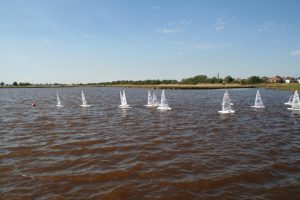 With visibility still tricky (and the Rugby World Cup starting) the odd scrummage made the windward mark messy, but by race 28 all was settled anyway. Dave Fowler finished with another close win (his 13th) from Adrian Tomlinson, Peter Jackson, Jamie Blair and Tim Long, the latter two securing 3rd and 4th overall respectively. Owens finished 10, but retained 5th as Sharman finished 12,11. Jacksons 2,3 finish secured 7th from Swainson & Holland. South African entry John Wright (RSA) finished a solid 14th. Despite some novel rule interpretations and much discussion no protest had to be carried through and the event was generally considered a great success despite the sunshine!